Could you tell us something about your life? I was born in Çanakkale in 1919. When I was 8 years old, my father died. I studied in this city through middle school. I wanted to continue with my studies, but in this small town there was no high school, and my mother’s [financial] situation did not allow her to send me to a school in Istanbul. She wanted me to start working so I could learn a trade such as shoemaking or carpentry. With the mentality of the time, she used to say that a trade was [like] a gold bracelet that would allow one to make a living as an adult. I was jealous of students that went to other cities to continue their studies, but I was obliged to bow my head and [accept] my destiny. When our vacation was just about over, I began to feel a rebellion. In spite of my timidity, I wrote a letter to my [maternal] grandfather asking him if he could help me realize my desire. In those years, from a town so small, it was unheard of to send a letter by mail to a house that was 100 steps from where I lived. I wrote the letter in Rashi [script] because he did not know the Latin alphabet. Two nights I was agitated, knowing that he was a strict man. I had no way of knowing how he would react to my plea. For someone like me, it was like asking for the moon. When he came, he had on an affectionate smile. He said he had very much liked my composition and that he was very moved to read about my wish. He was going to write to his sons who lived in the United States to increase the amount [of monetary help] they used to send us every six months so that it would cover all my schooling expenses. I remember I had thanked him with my eyes brimming with tears. In Istanbul, I enrolled as a boarder at Haydarpaşa Lisesi (Haydarpasha High School), and then, to learn a foreign language, I attended as a private student at the [French] École St. Benoit. I could no longer continue to be such a [financial] burden. I had my mother come to Istanbul to live with me in one room, and in 1938 I began to work at a business establishment as an assistant of accounts. In 1947 I opened my own business, applying the skills I had gained during my employment. This was my “gold bracelet” that brought happiness to me and my family, which I hope will be till the end of my life. In 1990 I left my business to be near my sons and their families who had been living away, one in New York and the other in Montreal, for many years. At what age did you feel the need to write? My love for writing began when I was twenty years old. I began to write poetry about my life, beginning with the time I was left an orphan. Even later, when I was busy with my business, my hobby gave me the greatest stisfaction in my life. When I attained the proper rhyme and rhythm in my verses, I felt as the luckiest man on earth. When I was able to analyze or describe the tears (agony, suffering) of an orphan, or the sadness in a woman’s gaze, my own pain seemed to ease. I am today 89 years old, and I still have not been able to distance myself from these sentiments. My wife, my sons and their families, give me joy in living; they are the sunshine of my life. Who is a poet? Can you describe what a poet is? Poetry is an art, like an artist seeking to give the necessary colors to his painting in order to express what is in his imagination or his wish. A poet is the person who is able to make [readers] feel the pain of an unfortunate [person], the desire of a lover, or any human emotion, with his words. If the lines are decorated with rhyme and rhythm, I believe the thoughts gain better harmony. Despair, sorrow, love, optimism or pesimism, joy or mourning, are all part of our emotions. But my determination to avoid foreign words [in Ladino] distances me from my goal of being able to describe things as I feel them. As I am convinced that I cannot transmit all the sentiments of my heart, I don’t possess the qualities of a poet. I think in the Turkish language I am more successful in the descriptions of my feelings. We have read your poems in Ladinokomunita, El Amaneser and other reviews. Would you enlighten us on your other literary relationships? Many years ago, when Shalom had many pages in Judeo-Espanyol, I used to write a poem almost every week. Los Muestros (Brussels), La Lettre Sépharade (Paris and Washington), Sefaraires (Buenos Aires) have published my poems. In Madrid, Matilda Gini de Barnatan, who directs a Sephardic broadcast on Radio Exterior de Espanya, reads my poems on her program. Edmond Cohen of Paris does the same on the local radio program for Judeo-Espanyol speakers. Matilda Koen-Sarano, famous author, poet, and teacher of Ladino in Israel, uses my poems in her classes, and also reads them on the Judeo-Espanyol broadcast of Kol Israel (Voice of Israel.) An anthology prepared by Robert Schild included several of my poems, one of which was set to music. This year, my poem Primer Amor, set to music by Reneta Sibel Yolak, earned First Prize at Festiladino. We have read on Ladinokomunita that a book of your poems has been published. Would you give us some details? My poems are composed with the love I feel for Judeo-Espanyol. 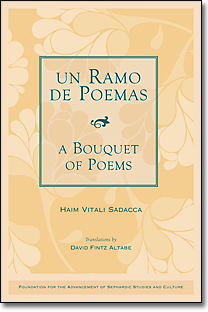 With the suggestions of Mesdames Rachel Amado Bortnick, Dr. Beki Bardavid, and Matilda Koen Sarano, and many letters from readers, I decided to prepare a book with the title Un Ramo de Poemas, with English translations by the poet Professor David F. Altabe (of blessed memory) in Florida. Unfortunately, before the book came to light, he died unexpectedly without seeing my gratitude noted in my book. He was a person of great merit. I wish to add that Mmes. Rachel Amado Bortnick and Daisy Sadaka Braverman worked very hard to read and edit the book before publication. With my partial participation in the costs, the book is being published as a project of the LPC (Ladino Preservation Council) and the FASSAC (Foundation for the Advancement of Sephardic Studies and Culture), thanks to the president of Ladinokomunita, Ms. Rachel Amado Bortnick, for whom I have great admiration for her efforts and dedication to have the [Ladino] language remain as a living legacy of our people. I hope the book will be successful, not for my own sake, but to help the organization take more positive steps to spread the knowlege of our language through books and brochures. At the same time I thank Mr. Bob Bedford, Executive Director of FASSAC, who brought my poems to light of publication. We congratulate you for winning First Prize at Festiladino with the song of your poem PRIMER AMOR. How did you have this contact to participate in this competition? Last year, during my days in Istanbul, Reneta Sibel Yolak called me saying she reads my poems and that she would like to enter the Festiladino competition. She asked my permission to compose the music so that she could participate in the 2008 competition. For me it was an honor, but to tell you the truth, I had no expectation of winning. Months went by quickly, and the morning of January 1, 2009, I received a call from Mr. Yehuda Hatsvi of Tel Aviv, giving me the news and congratulating me. My own joy was not so important – I was happy that Reneta would feel joy. I also cordially thank Mmes. Karen Gerson Sharhon and Güler Orgun for their efforts and dedication to have our Judeo-Espanyol remain as a legacy of great value forever. This interview originally appeared in El Amaneser (Istanbul), as Konoseremos a Vitali Sadacca [Let’s Meet Vitali Sadacca], by Güler Orgun. English translation is by Rachel Amado Bortnick. Reprinted with permission.